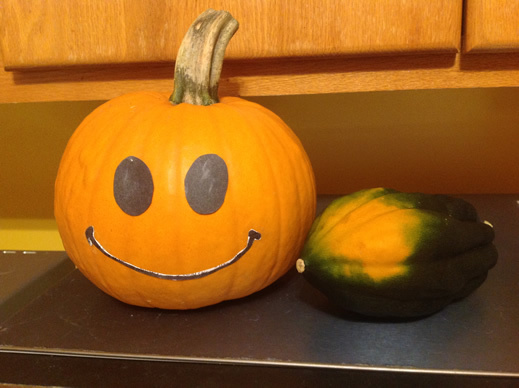 As I bring in an acorn squash from my garden as the last of the harvest of the year, my heart is filled with gratitude. Indeed I’m thankful for many other things. Here is a partial list. I am sure you can add many more to your own list (in Chinese, please). Thanks to my parents for bringing me up. Thanks to my family members for loving me. Thanks to my teachers for educating me. Gǎnxiè péngyǒu fēnxiǎng huānlè jí fēndān yōulǜ. Thanks to my friends for sharing my joys and worries. Gǎnxiè línjū de yǒuqíng hé bāngzhù. Thanks to my neighbors for their friendship and help. Thanks to my colleagues for their collaboration. Thanks to the farmers who produce food for us. Gǎnxiè yóuchāi dìsòng xìnjiàn jí bāoguǒ. Thanks to the mailman for delivering the mail and packages. Gǎnxiè nénggòu jūzhù zài wěndìng de shèhuì. Thanks for being able to live in a stable society. Gǎnxiè nénggòu hūxī xīnxiān de kōngqì jí hē qīngjié de shuǐ. Thanks for having clean air to breathe and clean water to drink. Gǎnxiè yǒu měihǎo de dàzìrán kěyǐ xīnshǎng. Thanks for the beauty in nature for everyone to appreciate. Gǎnxiè yǒu yuè’ěr de yīnyuè fǔwèi wǒmén de xīnlíng. Thanks for the beautiful music that comforts the soul. Thanks for the Internet that connects me with a wealth of knowledge. Gǎnxiè dúzhě ài yuè wǒde shū jí wǎngyē. Thanks to my readers for reading my books and web page. Things may fall short of the best but still be better than the worst. In Chapters 11 through 14 of the book “Learn Chinese Songs and Rhymes” we studied a number of action words (verbs), one of which is 跳 (tiào jump). This same word also means to leap, to hop or to skip. Fleas are called 跳蚤 (tiàozǎo) because they jump around. 跳动 (tiàodòng) is to move up and down or to pulsate. Nǐ de màibó měi fēnzhōng tiàodòng jǐ cì? 跳班 (tiàobān) or 跳级 (tiàojí) means to skip a grade. 跳槽 (tiàocáo) means to change job. This usually refers to the situation in which one goes to work for another company to the current employer’s disadvantage. 跳行 (tiàoháng) means to skip a line while reading. It can also mean to change one’s 行业 (hángyè trade or profession). In this case, it is synonymous with 改行 (gǎiháng). 心跳 (xīntiào) means heartbeat or palpitation. Wǒ hàipà jíle, xīntiào bùtíng. I was extremely scared, and my heart thumped without stopping. 眼跳 (yǎntiào), or 眼皮跳 (yǎnpí tiào), refers to the involuntary twitching of the eyelid. Some people believe that twitching of the lower eyelids predicts a happy event, while twitching of the upper eyelids foretells bad news. 心惊肉跳 (xīnjīngròutiào) describes a state of apprehension, in which the heart beats fast and the flesh shakes. 下棋 (xiàqí) means to play a strategic board game involving small pieces. The game of go is called 围棋 (wéiqí). 西洋棋 (xīyáng qí) is the chess game. Chinese chess is called 象棋 (xiàngqí). The checkers game is 西洋跳棋 (xīyáng), and Chinese checkers is 跳棋 (tiàoqí). The checkers game is comparatively simple. You can move only diagonally, one space at a time. When an opponent’s piece is in your way, you can jump over it and capture the piece. Whoever captures all of the opponent’s pieces first wins. In Chinese, capturing an opponent’s piece is called 吃 (chī eat). This word is also used in the game of mahjong when you are able to form a meld by taking the piece that the previous player has just discarded. 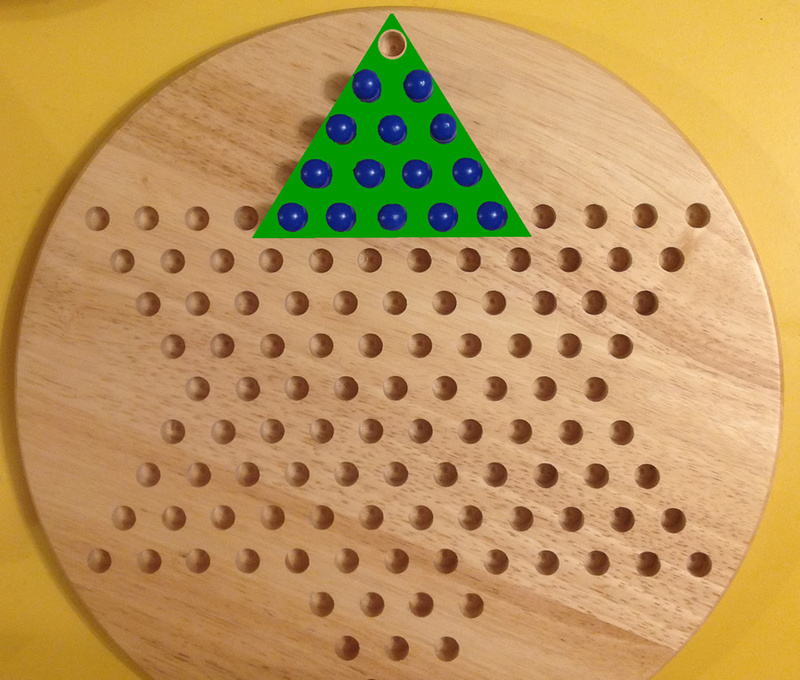 With the game of Chinese checkers, you can move a piece only when there is a neighboring piece that can be jumped over. You don’t “eat” an opponent’s piece. Rather, your goal is to get all of your pieces across the board to the triangular area on the opposite side. Whoever accomplishes this first wins. You can have up to six players in a game, but usually it is played with two or three players. 竞争 (jìngzhēng) means to compete, and 竞赛 (jìngsài) is a competition. If you would like to find out more about the personality of your friends or colleagues, invite them to a friendly game of Chinese checkers. Are the players 冷静 (lěngjìng sober and clam) or 急躁 (jízào impatient)? Do they adhere to the rules or do they try to cheat? Xiàqí yào zūnshǒu guīzé, bù kěyǐ làipí. When playing the board game, we must follow the rules and not cheat. Yíng jiā bù yào deyìyángyáng. The winner should not act too cocky. Shū jiā yào bǎochí liánghǎo fēngdù. The loser should maintain good demeanor. Zhègè mí tí bù róngyì jiě. This puzzle is not easy to solve. The Chinese words 豆 (dòu) and 豆子 (dòuzi) can refer to beans or peas. Therefore, you’ll need to add another character to the word to clarify what you are talking about. 绿豆 (lǜdòu) are mung beans. 红小豆 (hóngxiǎodòu) are the little red beans used for making sweet red bean paste. They are often referred to simply as 红豆 (hóngdòu), although this term can be applied to any bean that has a reddish color. In fact, the Chinese call the red seeds of the Abrus precatorius (crab’s eye) 红豆 (hóngdòu) or 相思豆 (xiāngsī dòu love bean). 相思 (xiāngsī) is the longing between lovers or close friends. This word can be used as a noun or a verb. Before I looked up information about these seeds at this link, I did not know that they are poisonous. Young people give these to friends as a token of their affection, and I did receive a few of these seeds on a couple occasions before. during the Tang Dynasty, or 唐朝 (Tángcháo). and in spring they issue a few new shoots. as this thing evokes the most intense longing for a dear friend afar. That is true if the conditions are favorable and the seeds germinate and grow, and the seedlings are not devoured by critters. Young bean shoots and the tender new growth at the tip of the vines are called 豆苗 (dòumiáo). They are delicious stir-fried or added to soups. When the 豆荚 (dòujiá bean pods or pea pods) have swollen but still green, the seeds that you find in them are young and tender. At this stage, they are referred to as 毛豆 (máodòu fuzzy soybean) because of the fuzz covering the pods. In Japanese they are called edamame. 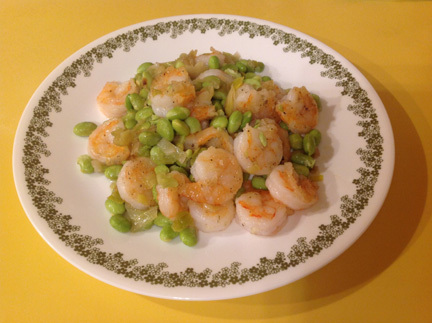 The tender green seeds look somewhat like lima beans but have a smoother texture and a more subtle taste. They are excellent as a snack or in stir-fried dishes. When fully ripened, the seeds are hard and take on a light yellowish color. Those are the 黄豆 (huángdòu soybeans) used for making soy milk, bean curds, bean pastes and sou nuts. 豆腐 (dòufu bean curd, tofu) is an important source of protein for many Asian vegetarians. Many Chinese drink 豆浆 (dòujiāng soybean milk) as part of their breakfast. 豆腐皮 (dòufupí) is the protein-rich film that floats to the top when you cook soy milk. This term also refers to very thin sheets of bean curd or the outer layer of deep-fried bean curd. Tofu products are often flavored with 酱油 (jiàngyóu soy sauce), yet another food product made from the amazing soy beans. Sweet bean pastes are called 豆沙 (dòushā). These are used as fillings for moon cakes, sweet rice dumplings, buns and many other snacks. If you have a handful of soy beans, you could put them in a jar of water and grow your own bean sprouts, or 豆芽儿 (dòuyár). The soy bean sprouts are larger than the mung bean sprouts that are sold in the supermarkets. Following are a few words that make use of the “bean” radical. 短 (duǎn) means short, brief, lacking or a weak point. 鼓 (gǔ) is a percussion instrument like a rattle or a drum. As a verb, this word means to strike (a musical instrument), to agitate or to swell. 厨房 (chúfáng) is the kitchen. 逗留 (dòuliú) is to stay or stop at a place. 登 (dēng) is to ascend or scale a height, as in 登山 (dēngshān mountain-climbing). To put an article in a magazine or newspaper is called 刊登 (kāndēng). You already know how to draw a horizontal stroke to write the numeral 1 in Chinese. There is a set of more complicated characters used for writing the numerals on checks, banknotes and currencies to help prevent alterations. For the numeral 1, the “official” character is 壹 (yī). I’ll let you do some research and find out what the characters are that represent the other nine numerals. The picture at the right shows a small plate of sliced tofu. Looking at it, can you envision the Chinese character 皿 (mǐn)? As mentioned last week, this character represents a dish or a container. Not surprisingly, it shows up as a radical in the words for such items as plates, cups or basins. 盘 (pán) is a plate, a dish or a tray. It also stands for other flat items like 棋盘 (qípán chessboard, checkerboard), 地盘 (dìpán one’s own territory), 沙盘 (shāpán sand table) and 算盘 (suànpán abacus). It will be good to note here that 盘算 (pánsuan) is a verb that means to calculate or to plan. 股票 (gǔpiào) are shares of stock, and 股票市场 (gǔpiàoshìchǎng) is the stock market, often abbreviated as 股市 (gǔ shì) or 股盘 (gǔpán). 股市崩盘 (gǔ shì bēngpán) would be a collapse of the stock market. 盅 (zhōng) is a cup without handles. One of my favorite dishes is the 冬瓜盅 (dōngguā zhōng), which is a winter melon soup served in the melon itself. With just a touch of 糖 (táng sugar) and 盐 (yán salt) and the flavors contributed by the melon flesh, the mushrooms and a variety of quality meats and seafood, this soup is a treat for the taste buds as well as the soul. 盆 (pén) is a pot, a tub or a basin. A flowerpot is called 花盆 (huāpén). A washbasin is called 脸盆 (liǎnpén). 盒子 (hézi) is a box. Tā dài gěi wǒ yī hé qiǎokèlì táng. He brought me a box of chocolates. Please review Chapter 7 of “Learn Chinese through Songs and Rhymes” and read about other types of containers that are often used as units of measure. 盏 (zhǎn) is a small cup, 灯 (dēng) is a lamp and 黑夜 (hēiyè) means dark night. Xīwàng xiàng shì hēiyè li de yī zhǎn dēng. Hope is like a lamp shining in the dark night. 益 (yì) means beneficial, increasingly, or a profit. 盛 (shèng) means abundant, plentiful, prosperous or popular. 盈 (yíng) means being full or having a surplus. 溢 (yì) is to overflow. 滥 (làn) also means to overflow or to flood. This character is used in words that represent excessiveness or indiscriminateness. He abuses his power (authority). 盗 (dào) means theft, robbery, a thief or a robber. 监 (jiān) is to watch or to supervise. 监视 (jiānshì) is to keep watch on someone, and 监牢 (jiānláo) is a prison. 温 (wēn) means warm or lukewarm. In this character we have water (as represented by the water radical), heat (as represented by the sun radical) and the vessel radical. A bowl of warm water comes to mind. 蓝 (lán) is the blue or indigo color. You do need a container to prepare the indigo dye. 头盔 (tóukuī) is a helmet. I guess you could look at it as an inverted vessel. Qí mótuōchē shí yào dài tóukuī.